Complete 10% of all quests in the main story. Increase the progress of all main quests from 10% to 20%. Increase the progress of all main quests from 20% to 30%. Increase the progress of all main quests from 30% to 40%. Increase the progress of all main quests from 40% to 50%. Increase the progress of all main quests from 50% to 60%. Increase the progress of all main quests from 60% to 70%. Increase the progress of all main quests from 70% to 80%. Increase the progress of all main quests from 80% to 90%. Increase the progress of all main quests from 90% to 100%. Complete 75% of the item encyclopedia. Play at least 200 hours (game world time, not Earth time!) with an active light spell. It doesn't matter if the light is activated using items or magic. Discover and explore at least 20 optional areas or dungeons. 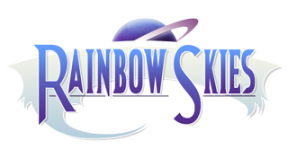 Spend at least 500 Rainbow Coins at the Healer. Find and collect at least 150 items that can be picked or collected in the world. Complete 50 or more optional side quests. Repeatable quests only count once! Inflict negative conditions on enemy monsters at least 100 times. Unlock a five star battle rank at the Tutor. Catch at least 75 fish. Win 100 prizes of category B or better. Use and study 40 magic books. Expand a skill pattern of any skill 30 times. Eat 50 of any food to do more damage in battle. Unearth at least 50 buried treasures. Permanently increase any attribute for any characters 10 times using food. Achieve sales level 2 in any shop. Upgrade weapons or equipment by using them in battle 15 times. Improve equipment 100 times at the Blacksmith using any materials. Upgrade any piece of equipment to '+5' by using crystals. Achieve 75 amount of level ups. This includes all team members, monsters and main characters alike. Bring all three main characters to level 70 or higher. Steal at least 100 items from monsters. Defeat 1,000 or more monsters. Cause 100,000 damage with any attack. Find a total of 25 Moon Trophies. Raise the level of any skill to 25 or higher. Purchase 100,000 coins worth of items from any merchant.